Double Your Donation to Kundiman on #GivingTuesday via Facebook! 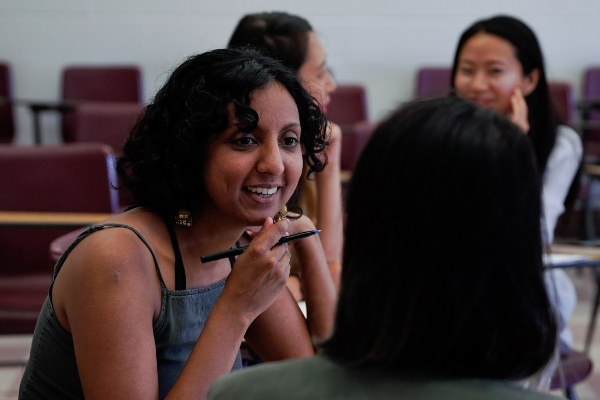 Fiction fellow Vani Natarajan at the 2018 Kundiman Retreat. #GivingTuesday, the Tuesday that follows Thanksgiving, marks the beginning of the charitable season, when many focus on their holiday and end-of-year giving. To learn more about Giving Tuesday’s history, visit givingtuesday.org. We’re super excited because Kundiman has an opportunity to maximize our gifts on Giving Tuesday! In support of #GivingTuesday on November 27, 2018, Facebook is partnering with PayPal to match up to $7 million in donations made on Facebook to eligible US-based 501(c)(3) nonprofits. Donations up to $250k per nonprofit and $20k per donor are eligible to be matched. Facebook and PayPal will match donations starting at 5am PST/ 8am EST and will continue matching donations made to nonprofits until the $7M match runs out. Well, when’s the best time to give? The best time to give your donation to Kundiman on Facebook would be on Giving Tuesday, November 27th at 5am PST/8am EST on any Kundiman Fundraiser Button set up by staff, board, and fellows, or at this link. That’s lit. Is there any way I can help? Create a Kundiman Fundraiser Button on your Facebook account and share a post to help raise funds. Thank your friends and family as they donate to your button. Tag Kundiman in your thank yous so we can also send love their way. Aw, I’ve got finals. Are there other ways to help? Be a leader and make your donation early to set the giving trend. Re-share our posts for the existing Kundiman campaigns and include a short message on why you stand with Kundiman. Suggest to your networks to Like and Follow Kundiman on Facebook. As always, we appreciate your giving and extend a warm thank you! Older PostCongratulations to Kundiman's Winners & Finalists for the National Book Awards!